Please note: This is a summary and analysis of the book and not the original book. If you'd like to purchase the original book, it is available from Amazon and Audible. Management expert Morten T. Hansen reveals the secrets behind top performance and productivity. He presents a compelling case for working less while still achieving more without compromising your work-life balance. For so long, we have been taught that you have to break your back and hustle till you die, just to become successful. However, Hansen provides scientific data that shows how top performers do the exact opposite. You don’t have to work hard - just work smarter. With seven smart work practices, you will improve your work performance and be able to enjoy more personal time. If you have been miserable working hard and getting nowhere, reading Hansen's book will change your life. 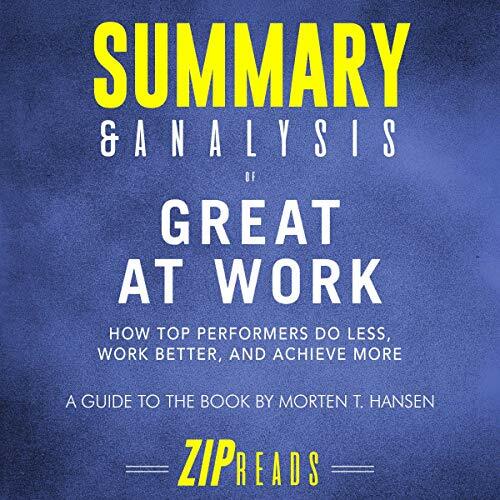 Disclaimer: This audiobook is intended as a companion to, not a replacement for, Great at Work: How Top Performers Do Less, Work Better, and Achieve More; ZIP Reads is wholly responsible for this content and is not associated with the original author in any way.